Soap. Simple, right? You use antibacterial squirt soap at the sink, have a bar of bath soap at the tubs, and gallons of laundry soap near your washing machine. But do you have enough? Take a look at your receipts for last year. How often did you buy these things? Did you have enough? Did you have spur-of-the-moment trips to the store because you ran out of Cheer in the middle of doing laundry? Did you know that in a pinch, you can use bar soap in your hair, and do you really need the convenience of squirt soap when bar soap will work just as well? How about using that same bar soap to do a load of wash (shavings)! Do an inventory check. Then do a reality check. How much do you REALLY need per week. Per month. Per year. Then make sure every time you buy one soap, you buy an extra or two for your storage plans. The human body can survive for three days without water, even less in arid or hot environments, still less when performing hard work. One needs at least a gallon of water per person per day per household. This is drinking and cooking water. Washing water should be factored in separately. Since I am at college I have only myself and my roommates to provide for, however I have taken the liberty to stockpile water in plastic soda bottles and milk jugs. I have only enough for a few days; after that I'd have to resort to transporting it from the creek out back of the apartments. I pre-treat my water with 1/8 teaspoon of plain bleach per gallon, or even 1/8 teaspoon/half-gallon. Keep in mind that with this method of water storage, you must dispose of the containers every six months or so (the milk jugs in particular tend to degrade quickly). Storage in jerry-can-type water-cans, such as were used from WWII through current conflicts. These can be found in varying condition from various sellers. The best are lined with ceramic or some such as this prevents the growth of mold, mildew and bacteria while insulating your wasser for those hot days in the field. Storage in HDPE "blue cans," these are the most cost-effective method to stockpile transportable amounts of water, usually between 3 and 5 gallons. Storage in Food-Grade 55 gallon drums. Food grade barrels can be found for cheap, or even free from suppliers of honey, molasses, and various other types of food industries. You will want to pressure-wash these to remove traces of whatever was in them before you picked them up. Also keep in mind that while this is a viable option, it is hard to refill them or clean them without a pressurized water source, thus, this should not be your only means of storing water. The steel 55 gallon honey drums which my uncle sells from our corncrib back home are great for use as rainbarrels, which is a very effective way to put to use whatever precipitation drains off of your roof. Even a very small roof will collect a sizeable amount of water. It is a good idea to set up a gravity-fed irrigation system for your planters or garden boxes using rainbarrels. Storage in large, buriable tanks. This is a good way to stockpile water, however you will want to have not only an inlet but a way to bleed it and also a way to treat it (such as bleach or pool crystals). 1. Drinkable water on hand: This is primarily bottled water. We have roughly a dozen cases on hand at any given time. I hope to double that amount very soon. We add a few cases each time we go to Costco or Sam's. 2. Accessible water on the property: For us, this includes the water in the water heater, a well, any water remaining in the pipes of our orchard sprinkler system, and our pond. I wouldn't want to drink the water from the pond unless necessary, but we could certainly use it for flushing toilets when needed. And in a worst case scenario I have everything I need to make the pond water safe enough to drink. 3. Water in the area, within walking/carrying distance: We have several small streams/rivers within just a couple of miles of our ranch. Water is heavy and I wouldn't want to transport too much of it very far, but it's good to know where it's at. So following this logic, there is a strong case (perhaps stronger a case than for stockpiling food) for the stockpiling of drinkable water and the upkeep of water-collection systes BEFORE SHTF. 4. A hand-pump for our wells. This is something I've yet to convince my Dad is the most important prep-item you can get. Problem is it's a relatively expensive procedure. However in an emergency it'd be worth its weight in gold. Just be sure to place it in a location unavailable to the general public or its liable to walk off. 5. A dedicated water-tank for SHTF scenarios. Remember that if it's not properly maintained, mold or other nasties are sure to grow in it. My pal Eric states that the human body needs 80 oz. of water per day in comfortable weather WITHOUT hard work. He says that if one is eating MREs or other emergency rations, the amount of water necessary for digestion rises dramatically, so plan for 80 oz. of water/day/person. For two people that would be 8.75 gallons of DRINKING water per week, or 35 gallons per month. He says an average-sized dog drinks approximately 1-1.5 gallons per week. A small dog or cat would probably drink less than a half-gallon per week. So to keep two people and several dogs hydrated for a month, one would need 65 gallons. That is ONLY DRINKING WATER and DOES NOT include water for cooking, washing dishes, clothes, flushing toilets, etc. What does this mean? This means we should each have on hand at least 100 gallons of fresh, non-contaminated drinking water. This is just for two people and some pets! Add a gallon of drinking water per day per person per household, and you may well end up deciding that you need a 300-gallon water tank IN ADDITION to your stocks of easily-transportable drinking water. As always, remember that without the benefit of either an artesian well or a hand pump, one is at the mercy of the droughts and at the mercy of the rescuers. Thus it is absolutely imperative that we all have a good supply of drinking water on hand AND have the means to get more from our immediate water table. Those of us who live in the cities or suburbia will have a harder time meeting these needs. In a long-term SHTF scenario, these folks will have to relocate in order to be able to draw clean drinking water from streams, springs, lakes etc. www.hewsystem.com ---> expensive, holds less. www.waterbob.com---> less expensive option, holds more. www.aquatabs.ca ---inexpensive way to treat small amounts of water, (bleach based). http://shop.monolithic.com/products/...ic-drip-filter ---> less expensive option, best used in addition to bleach, iodine, boiling or other methods. If anybody has any suggestions as per other ways to store/treat/swap water and boost water collection during droughts, let me know. With the horrible pictures of the peanut butter factory, mold growing everywhere, critter droppings, etc..... who on earth would ever buy peanut butter again? And is that peanut butter powder we have stored safe? Better to be safe. I found this recipe for making your own peanut butter. Experiment with cashews, almonds, macadamia, and other nuts too. Spread raw in-the-shell peanuts evenly on a cookie sheet. Bake in a preheated 350 degree F oven for 15-20 minutes, stirring often. When peanuts are done, the shell will be brittle, and the "skin" will slip off easily. They'll be light brown with a roasted flavor. Place 1 cup of freshly roasted/shelled/de-skinned peanuts into a blender or food processor. Turn on machine and while it runs, drizzle about 2 tablespoons of peanut (or canola) oil through that opening at the top. Rule of thumb: 1 cup of Virginia peanuts + 2 tablespoons of oil OR 1 cup of Spanish peanuts + no oil. Add a dash of salt (to taste). Process until you get the desired texture (crunchy or a little bit longer for smooth). Store any leftovers in the refrigerator. Note that it won't last very long because it has no preservatives so try to eat within a couple of days. The oil may/probably will rise to the top so just carefully mix it a little before using. NOTE: It will feel a little less dense and taste differently than what you get at stores, but that's because it doesn't have all of those heavy shortening oils and preservatives. Nut butters are a great way to get protein. They have lots of nutrition with vitamins and minerals. Keep your nuts (and seeds and peanuts) in the freezer until ready to roast, shell and make into nut butter. This is a great way to get peanut butter that you're pretty sure is free of contaminants. To be 100% sure, grow you own peanuts and nuts! 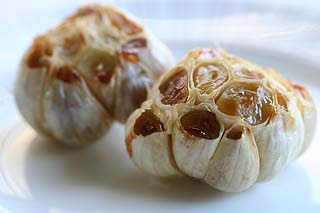 Peel the outer skin from the garlic bulb but make sure the skin around the individual cloves stay put. With the root end on your cutting board, slice the top 1/4 off the bulb. This will expose the cloves. The root end will keep the cloves all attached together. Place the garlic head (bulb) on a sprayed piece of aluminum foil. (Some people use small pieces of aluminum in a muffin pan so they won't move around.) It's okay to place more than one bulb per piece of foil. Drizzle the bulbs with some olive oil, using your fingers to ensure the garlic bulb is well coated. This will prevent burning. Cover with more aluminum foil. Bake for 30-35 minutes, or until the cloves feel kinda squishy and soft when pressed. Allow to cool slightly. Use a small sharp knife to slit the skins around each clove. Squeeze the roasted garlic cloves out of the skins. This is especially tasty when spread on crispy buttery bread. Or mash with a fork to use for cooking or adding to salad dressings. Or mix with sour cream to top baked potatoes. Or add to a little parmesan cheese, butter and pasta. FYI: The big "whole" is the bulb, and the individual parts are called "cloves. Some people (yes, including the past me) get these mixed up. Alternate: Instead of using the oven, you could roast it in the foil on a grill. The aroma it gives off sometimes flavors other foods on the grill. Swiss chard is one of the easiest crops you can grow in your survival garden, and it’s quite nutritious as well. Pictured above is Bright Lights Swiss chard, a very popular variety that produces colorful long stems that will amaze you. Your kids will love the various bright colors. I’ve grown this variety, and I’m not kidding when I say you’ll see electric yellows, pinks, crimsons, oranges, purples, whites, and greens. Some of the stems will keep their color even after cooking. Several features make Swiss chard easy and fun to grow. The seeds are large enough to handle easily. If you’re square foot gardening, you can plant four per square foot. This makes Swiss chard ideal for containers, too. Chard will grow from spring through fall, and you can even over winter it with protection, as I’ve done in a greenhouse, though it’s not known as a hardy plant. Leaves are ready to harvest 60 days after planting. One thing I like best about Swiss chard is that it’s a “cut and come again” crop. Cut off leaves to within a couple inches of the crown, and it will grow back to produce more. It’s an ideal low maintenance crop. Swiss chard can be eaten raw or cooked. It’s quite tasty in a fresh salad or cooked like spinach with a little butter. The flavor is mild, not strong like some greens. A cup contains one gram of fiber, one gram of protein, 44% of the recommended daily amount (RDA) of vitamin A and 18% of vitamin C. It also contains calcium, iron, thiamin, riboflavin, niacin, pantothenic acid, vitamin B6, potassium, phosphorus, magnesium, zinc, and copper. When you’re ready to order Bright Lights, click on the picture above, and you’ll be taken to the page on the Park Seed site featuring Bright Lights Swiss chard. Of course, Park’s has other varieties, if you’d like something a little more conventional and less flashy. There are 125 seeds to a packet, and you’ll want to get several packets to have on hand. You don’t have to be a gourmet gardener or cook to put some color and nutrition in your survival garden. Grow some Swiss chard, and you’re sure to have a supply of excellent, easy growing, nutritious greens. I was re-reading "Little House in the Big Woods" by Laura Ingalls Wilder to create a test for VHTS. It kept mentioning salt-rising bread, so I looked it up. This is a bread developed in the early to mid 1800's (1830-1840's) by pioneers who couldn't get a hold of "already-made yeast"- either because they couldn't afford it or because they were too isolated. This takes planning, and a willingness for a stinky house, but if you don't have yeast and want a risen bread, this recipe will be great for you! You need: 1 medium Irish potato, sliced and placed in a big jar. Cover and let rise in warm place until morning. Place in a box surrounded by a heating pad on warm if your house is too cold. If mixture is foamy and “smelly” the next morning (which is what you want! ), pour the liquid into your mixing bowl and throw away the potatoes. Mix 2 cups very warm water with 1/2 cup shortening (we like olive for a savory or walnut for a "sweet"). Then add 1 teaspoon salt, 4 teaspoons sugar, and 5 cups of flour. Combine with the stinky rising mixture to make a stiff batter. Let rise in a warm place until double in bulk. Work in another 6 cups of flour to make a soft dough. Lightly knead. Divide into 3 portions. Let them rise for 10 minutes. Knead for 3 minutes. Place in greased pans. Let rise until mixture comes to top of the pan. Bake at 450 degrees F for 15 minutes, then lower the temperature to 400 degrees F and bake for another 25 minutes. This doesn't really translate into a bread machine. Dehydrated-Freeze Dried foods have a longer shelf life than foods that are canned with liquid. While I feel there is some wiggle room with "use by dates" on canned items unless you are rotating and going through stock rather quickly you might have some dust covered canned beets from 2003 that you may not feel are still safe to eat. A way to avoid this altogether is to purchase freeze dried food. Freeze dried food has an incredible shelf life of up to 25 years. You will not get that with traditionally canned goods no matter how careful you are in rotation of cans. Freeze dried foods with a 25 year shelf life can take a lot of worry out of your preps as you do not have to worry if something has gone bad. Having opened a few cans of nasty smelling and lumpy looking canned goods this could become a life or death situation if a person isn't careful. I also think that because of weight issues, freeze dried foods are easier to transport in a "bug out" situation if the need arises. Mountain House offers several different options for preppers who want to add freeze dried food to their larder. If you have never ate freeze dried food I would suggest you get a 72 hour emergency kit and eat it. For the price of a dinner out($52.00) you could sample the food and see if it would fit with your preparedness plans. Freeze dried food is also a good choice for BOBs (bug out bags) again because of the weight. Do not forget that hot water is needed to rehydrate the food so where ever you have it stored, do not forget that you will need a means of heating water to prepare it. A mess kit and magnesium fire starter should also be in your BOB so no need to fret. To learn more about freeze dried food and for ordering info from Mountain House check the link- you will be suprised with the amount of choices there are. Rhubarb is one of those interesting plants which you do not generally chance upon a lot of information on. You will certainly encounter difficulty locating it in your local supermarket. I would like to take you on a gardening journey from growing your own rhubarb to harvesting it and finally to creating some tasty Rhubarb – Lime jelly. In most parts of America you would not encounter any problems growing this perennial vegetable. It is well worth your efforts to cultivate it in the home garden as it is readily enjoyed in jellies, pies and sauces. Rhubarb is usually planted off by itself at the far end of your family garden and is best left alone. It will be productive for at least five years. Six plants will produce sufficient rhubarb to satisfy a family of four with possibly a little left over for the neighbor. Plant your rhubarb in the early spring while your plant roots are still in their dormant stage. Use plants or divisions as seeds are extremely difficult to grow in most places other then the deep southern portion of the United States. The crown bud of the plant should be about 2 inches below the soil with 36 inches spacing between each root planted. Rhubarb rows should be approximately 3 feet apart. Make certain that draining is good in the area where you intend to plant the rhubarb as they do not like wet feet. Prior to planting your roots work the soil well with compost to increase the rhubarbs production. If you already have several rhubarb plants you can dig up the roots and divide them to make additional plants. Simply cut the root into four sections. Ensure that each of these sections has at least a single strong bud. This process should be accomplished at least every five years to ensure healthy and vigorous plants. Plants older then five years tend to become very crowded and their production decreases drastically. Use only your healthiest plants for this spring thinning and discard the rest. Maintain the rhubarb area free of weeds inspecting it on a weekly basis. Apply fertilizer generously at the start of the growing season and continue to side dress the plants as the year rolls on. Irrigate the crop during periods of dryness and do not permit it to dry out excessively. Since the newly established plants need abundant foliage to create a strong root system do not attempt to harvest any plants during the first season. During the second season you may harvest the stalks for one or two weeks, but after that you can safely harvest for the full eight to ten weeks. To harvest the plants pull the plants stalks and proceed to trim the leaf blades from each. Do not use the leaf blades as they contain oxalic acid. Remove only 1/3rd of the leaves so the plant will remain healthy and continue to produce. Should your plant develop seed stalks and flowers quickly remove and discard them. The petioles or leafstalks should be of high quality with bright color, tenderness and flavor. The stalk should be thick and crisp when you break it off. The major pest for your new rhubarbs will be the Rhubarb curculio which is a beetle which bores holes into the stalks and roots of your plants. Should you encounter badly infected plants with a vast number of beetle eggs simply burn them in July. And now for the fun part. You have already grown your rhubarb so now let’s make some tasty Rhubarb Lime Jelly. Wash your rhubarb stalks well and cut them into small chunks. Puree these chunks in a food processor using a cheesecloth for extracting your five cups of juice. Mix the rhubarb and lime juice with the calcium water in a pot. Mix the pectin with the sugar in a bowl. Bring the mixture in the pot to a boil and then add the sugar/pectin to it bringing it once again to a boil. Remove the pot from the heat and then ladle the mixture into pre-sterilized jars making certain to leave a 1/4" headspace. Process the jars in a boiling water bath for a period of 10 minutes. Be certain to adjust your time according to your altitude. Your family is certain to enjoy this treat. Mix ingredients together well. It leaves a refreshing minty taste in your mouth and prevents bad breath. Essential oils can be purchased at your health food store. When making your own soap, it's always important to follow a few basic steps. The first is being sure you start with quality ingredients. I personally used beef tallow, (fat gathered from around the kidneys.) I have gotten terrific tallow and "meaty" tallow before, so when shopping, be picky if you can. Tallow is a flaky, compact fat that's white in color, although will sometimes contain blood or tissue from the beef. The less red that it contains, the cleaner and purer the fat. Most of the time, I get mine from a local butcher. It takes 6 - 7 lbs. of fat. To start, I will dice the fat into pieces about a half inch square. Yes, it takes alot of time and your hands will get incredibly greasy, but i don't have chapped hands for a week! It's better to dice it small, though not too small, 1/2 inch works for me. I then will get out my cast iron pot( a stainless steel pot will work) and pile it all in. I block the pot up on bricks and build a small fire underneath, cover the pot to keep the ash out. This is one of the places where you must be patient. Do not build the fire high, a low-medium fire is best in my experience. You run the chance of scorching the fat if the heat is too high, and all the work can be lost as the fat takes on the burned smell. Nasty smelling fat can mean nasty smelling soap! Stir the fat around every few minutes from side to side and top to bottom. You'll start to see the fat turning to a clear/golden liquid. This is a good sign! So far so good! Last time I processed tallow, it took about an hour for all the fat to melt down. I know I could do it faster, but I tend to be on the safe side than lose all my work. I let the fat cool a bit, then I take a ladle / strainer and scoop the leftover pieces into a metal bowl. I use metal simply because I do it while the fat is still hot and it would melt plastic and could break glass. Once I get all the fat pieces out of the liquid, I scoop the leftover fat into a pan and use my potato masher to squeeze the liquid fat from it into the stockpot. Be careful not to squeeze too hard, otherwise you will end up with small pieces of fat you will have to fish out later. Now that you have squeezed all the fat from the pieces, you can discard those if you wish (There are some soapers that will add water to the leftovers, boil it and then cool it down in the fridge. You can then scoop the remaining fat from the top, drain and add to the fat for making soap. I never went that far, But, I may do just that when TSHTF and I have to waste nothing). I'm really into pioneer food right now. 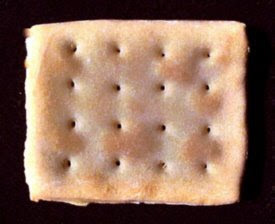 Never realized that hardtack is basically a rock-hard biscuit, or a thick cracker. If stored correctly, it could last for years. It could be made very cheaply (well, duh, flour and water!) and because it would last so long, it was a very convenient food for people who travel so it made it through wars, pioneer treks across the continent, explorations, and more... whenever someone needed to move fast and pack light. Hardtack was eaten by itself, or crumbled into coffee. Nowadays, you could dunk it in reconstituted powdered milk, or crumbled into soup. You could also crumble them into cold water, then fry the crumbs in the juice and fat of meat (a dish known as "skillygalee" or "cush"). Preheat oven to 400 degrees F. Combine ingredients and knead until smooth. Sprinkle some additional flour on a smooth surface. Roll dough flat until 1/4 inch thick. Cut biscuits out with a can or score and slice into squares or rectangles. Keep within 3-4 inches in diameter/across. Poke holes into each using a fork (see the picture above). Place on a floured cookie sheet. Bake 35-45 minutes until biscuits are hard and dry. In another few weeks, fiddlehead ferns will be popping up in woodland areas. These are the first wild edible that I'm aware of. You need to pick fiddlehead ferns when they are very young (like the picture) and before they have unfurled into true ferns. As with any wild edible, only pick a few in each area so that you don't destroy the whole supply for future wild edible hunters. Take a few from each area and leave some for the next person. Don't pull up the fern, just snip it off below the curl so that it comes back next year. Once you get your fiddleheads home, rinse them well and peel off the brown part of the plant. You can use them in a variety of ways but my favorite is to make a fiddlehead fern quiche. Cook crust according to directions. Combine eggs, milk and cream in a bowl. Add scallion and seasonings. Sprinkle half the cheese in the bottom of the shell, lay bacon and pour egg mixture over. Sprinkle rest of Swiss cheese, arrange Ferns on top and grate nutmeg over top. Bake at 375º for 30-40 minutes until set. Cool slightly and serve. As with any wild edible, make sure you know what you're hunting for. If you have any doubt whatsoever don't eat it. Hooray! More firearm fun today! In case you missed part 1, go read here. Today we'll be covering the basics of ammunition, so we'll discuss three types of ammunition (pictured left to right): Handgun, Rifle, and Shotgun. Handgun and Rifle ammunition are built very similarly. They have a brass case that holds a charge of powder in it, a primer at the bottom, and a bullet at the top. The full bullet/powder/case/primer setup is called a cartridge or sometimes a round (as in "a round of ammunition"). They're also frequently called bullets, although technically the bullet is only one part of the full cartridge. The primer is the part that sparks and burns the powder when it is hit by the firing pin on the gun. If the primer is in the center of the bottom of the case, it is a CENTERFIRE cartridge. The following picture is of a Centerfire Rifle cartridge. See the round section in the middle--like the center of a bullseye? That's the primer. When this rifle fires this round of ammunition, the firing pin will strike the center circle and it will ignite the powder inside the case. The powder burns, creating expanding gas which pushes the bullet out the top of the case and down the barrel of the gun. (This all happens very quickly--faster than you can say Bang!) Mostly larger cartridges are centerfire. The smallest cartridges are what's called RIMFIRE. .17's and .22's are in this group. They do not have their primer in the center, but have it in a ring around the base of the cartridge (on the rim of the base=rimfire). The following picture is of the bottom of a .22 rimfire cartridge. In order to fire this round, the gun's firing pin will hit the edge of the base to ignite the powder. The next picture is complements of gunczar.com and shows various rifle cartridges (from left to right: 17 HM2, .17 HMR, .22LR, .22 WMR, .17/23 SMc, 5mm/35 SMc, .22 Hornet, .223 Remington, .223 WSSM, .243 Winchester, .243 Winchester Improved (Ackley), .25-06 Remington, .270 Winchester, .308, .30-06, .45-70, .50-90 Sharps): A handgun is a gun that can be held and fired with one hand (not that that is the best or most accurate way to hold or fire them, but just that they can be). It generally does not have a stock and the barrel is shorter than a rifle or shotgun. Other words that refer to handguns are pistol and revolver (although a revolver is only one type of handgun). 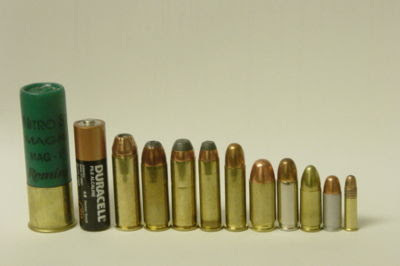 Following is a picture of various common handgun cartridges from leelofland.com (left to right: 3-inch 12-gauge magnum shotgun shell (for comparison), size “AA” battery (for comparison), .454 Casull, .45 Winchester Magnum, .44 Remington Magnum, .357 Magnum, .38 Special, .45 ACP, .38 Super, 9 mm Luger, .32 ACP, .22 LR): Did you notice the .22 LR (Long Rifle) round is in both pictures? Some bullet calibers can be fired from both handguns and rifles, and the .22 is one of the most common. Every gun's barrel has a certain inside diameter (called the bore size) that will only fit ammunition made that same size. Every gun is made to fire a specific caliber of bullet. This is also called "chambering" so if you hear someone's gun is "chambered" in 270, you'll know that's just the size of bore it has and is the size of ammunition it takes. If you try to load and fire a bullet that is larger than your gun's bore, you can have a nasty explosion on your hands. So ONLY use the ammunition specifically made for your gun. How can you tell what ammunition you have? USUALLY it is stamped on the base of the cartridge. This picture is of two different makers' .380 Auto round. They have the name of the manufacturer and the caliber stamped on them. The rimfire cartridge I showed did NOT have .22 LR stamped on it, only F for Federal--the manufacturer, so I guess you can't always tell your caliber by looking at the bottom, but this is the exception. Your firearm should also have the caliber stamped somewhere on or near the barrel like this: Look for it--make sure it matches the ammunition before using it! Now we've talked about the different kinds of primers and calibers of bullets, let's look at a couple of common kinds of bullets. Bullets are usually made of lead and covered with copper or some other metal. If they are fully covered, like the one on the right, it is called "Full Metal Jacket" or FMJ. If they have the tip hollowed out like the one on the left, they are called Hollowpoints, Jacketed Hollow Points, or JHP. FMJ rounds shoot similarly to JHP rounds until they hit the target. Hollowpoint rounds are made to expand when they hit the target so they cause more damage and do not shoot through the target as often. These are the rounds you want for self protection and hunting. FMJ rounds are less expensive and are great for target shooting for fun. Finally, we'll cover Shotgun Ammunition, also called shotgun shells. Shotgun bores and shells are measured in gauge, where the number refers to how many lead balls that diameter would be needed to make a pound. So a 12 ga. is larger than a 20 ga. since if you had a pile of 12 balls that weighed a pound and a pile of 20 balls that also weighed a pound the balls in the 12 ball pile would be larger than those in the 20 ball pile. Make sense yet? Smaller gauge number, larger diameter. Shotgun shells are built similar to the handgun/rifle cartridges except for a few differences. They have a primer and case, but a shotgun case is plastic. The powder is the same, but the shotgun shell has a "wad"--another piece of plastic to separate the powder from the shot. The shot is a bunch of little balls usually of steel or lead and can be purchased in various sizes. Some shotgun shells are loaded with a bullet called a slug instead of shot. Then the plastic is folded over and sealed at the top to hold it all in.